The Mac's Field Guides were originally designed to be used by kayakers as a reference for nature observations. The heavy duty lamination allows these to be used outside in any type of weather. Most of the field guides measure 11.5" x 7.5" and have information on both sides. 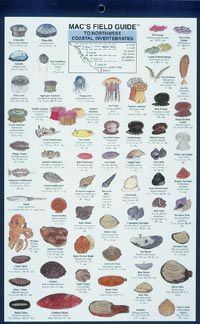 Some popular titles: Alaska Wildlife, North America Birds of Prey, Freshwater Fishes, Salmon and Trout, Northwest Coastal Fish, Invertebrates, Waterbirds, Northwest Garden Bugs, Northwest Trees, Pacific Northwest Wildflowers, and San Juan Island Wildlife. Item Number Field Guide Title Price Qty.